Cherry Mobile is back in the game through its latest Flare S7 series. Known for packing trendy features with an affordable price tag, we didn’t expect that the local mobile player would wow us this much through its Flare S7 Plus device. Having great offerings, we’ll see if the brand’s latest device has enough bullets to clash with international smartphone companies. For now, let’s put it in our own battle sheet to fight Vivo’s newest V11i. Let’s get it on, and see which phone has the upper hand! Cherry Mobile was able to steal the spotlight from global companies through its Flare S7 Plus. With the specs it has on its sleeves, the brand is now facing a match against Chinese mobile manufacturer Vivo through its toned-down V11 model, the V11i. Let’s begin with their display. The Vivo V11i got the first point with its slightly bigger 6.3-inch FHD+ screen. Vivo also armed its pick with a new Halo design, making its notch smaller than its rival. However, we have to note that both devices feature a 19:9 aspect ratio. To make this fight interesting, Cherry Mobile geared its device with the same hardware found inside the V11i. Both handsets carry a Helio P60 octa-core processor, paired with Mali-G72 MP3 graphics. However, although the two contenders are both banked with 4GB of RAM, the V11i has a larger 128GB of internal storage. Nevertheless, the Flare S7 Plus is also expandable up to 256GB via microSD card. Unfortunately, both smartphones will require you to use its SIM 2 slot if you wish to expand your storage. Moving on to its photography department, the rivals share the same 16-megapixel + 5-megapixel dual-rear camera setup, but the V11i took its lead with its 25-megapixel selfie snapper. The Flare S7 Plus sports a good 16-megapixel front shooter, though. The two devices come with basic connectivity features including dual-SIM, LTE, WiFi, and Bluetooth. The Flare S7 Plus, on the other hand, boasts USB Type-C compared with V11i’s microUSB 2.0 port. Moreover, although the V11i is equipped with a bigger 3315mAh battery capacity, the Flare S7 Plus also supports Fast Charging. In addition, the latter allows wireless charging while the V11i does not. For more secure options, the Flare S7 Plus and V11i are both equipped with fingerprint scanner and facial recognition. Both devices are running on Android 8.1 Oreo, too. While it's obvious that the V11i won this battle, we can still say that the Flare F7 Plus gave us a good match. 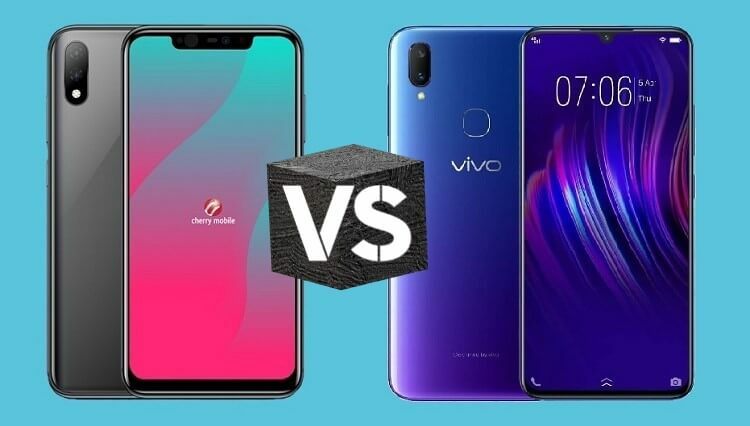 The Vivo V11i is priced at Php15,999, while the Cherry Mobile Flare F7 Plus is tagged with a lower asking price of just Php11,999.